Do you ever get to the point in your home where you just wish you could re-do part of it? And you can’t wait to see it happen? Fast-forward to today, and Rosebrook Gardens is now home to, quite frankly, the classiest and most elegant fitted pantries I’ve ever seen! Yes, plural—I decided to renovate the closet next to it as well. Beyond my expectations, thanks to the skilled Lukasz Czyz and the Lucas DeeLux Carpentry team. Both are kitted-out with door units, deep drawers, and sturdy shelves. The larger pantry boasts shelves in removable sections, to allow access to the water heater, the stereo system and the basement storage area with ease! My pantry evolution began with the transition from a big old-fashioned clunker water heater into an on-demand heater from Gault in Westport. You can witness that entire process experience on “Pitchin’ Kitchen”, episode 9 of Life on Mar’s Season Two. Now that the once-cramped pantry cupboard is fully usable space, I have been tweaking the arrangement of shelves until satisfied. Everything is an opportunity to organize! 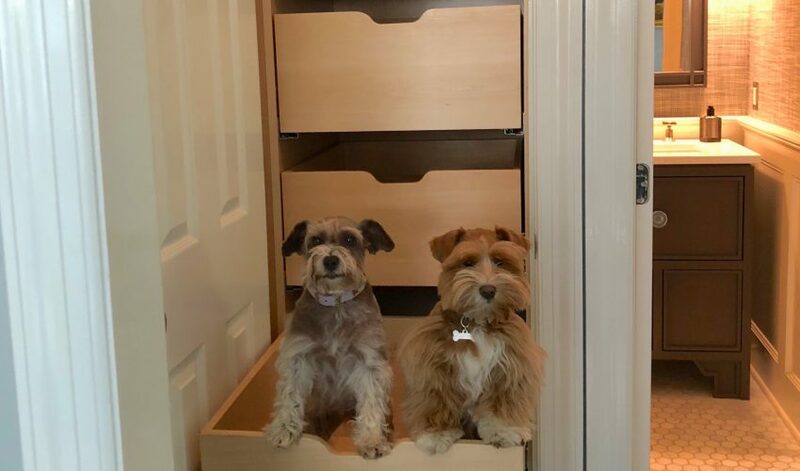 We even have a special area dedicated to canned dog food – because of course, Violet and Daisy get priority as far as storage space is concerned! 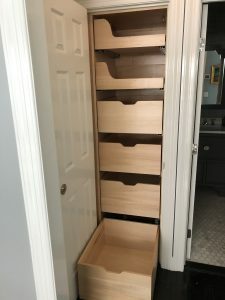 The drawers mean that the entire depth of the pantry closet is usable space—nothing gets trapped, unseen, in the back. I cannot wait to quickly find everything! As long as I can get past the pantry guard dogs, that is!